Many years have passed since I started breaking out - my pimples that is. Several dermatologists have come and go in my life. Through the course of finding who's the right one for me, I have realized that not all dermatologists who were able to cure my friend's skin can also mine. Pictured above are my before and after pictures. The photo on the left is dated April 2009, when I was still seeing several dermatologists, one after another, when their prescriptions and treatments weren't working for me. I have tried a lot of options in the past several years, just to see what will emerge as winner in killing my zits. I have tried taking in Isotretinoin, which is expensive and kinda dangerous to the kidney or liver when taken in excess. I have also tried using Proactiv and Obagi, which weren't effective on me as well. Intense pulsed light (IPL), is a technology aimed at producing light of high intensity during a very short period of time. It involves specific lamps together with capacitors whose rapid discharge provides the high energy required. In terms of rosacea, IPL offers one of the few effective treatments to relieve the facial redness associated with the disorder. After 6 consecutive sessions (once every month) of IPL, my facial skin showed immense improvement that many people have recognized. It has lightened the redness of the scars and made my face look more vibrant and young. Nowadays, I see to it that I go to Doc Mike once every month for facial and diamond peel to ensure that my face is maintained to look its best as much as possible. Of course, we have to take into account our food intake and sleeping habits and not just rely fully on our dermatologists. Imperial Dermatology's rates are lower than other derma clinics and is operated by a real dermatologist. 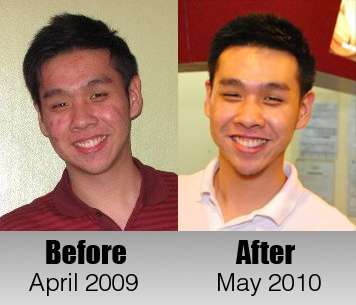 Try it out and see it Michael Chua is the right dermatologist for you. Tell him you saw it in Glenn Ong's site, and let me know your experience. Wow, that's really great work they did on your skin problems. @ Dementia, it's Php500 I think. I only paid for consultation once - during my first visit. The next ones kasi you can ask na while being treated. How much did you spend overall? Approximately lang, I'm going to convince my parents pa kasi eh. They were asking for the price. :( Or kahit yung first visit mo lang, how much did you spend. Hope you can help me. Thank you and please help me. hey. ang laki na ng difference. hehehe. galing ng doctor mo. Hi Glenn, ask ko lang kung after ng IPL sessions mo e may downtime ba? kung super pula ng ilang days ang face or kung may sugat. thanks!! Hi DA! No downtime, which is why it's a great treatment. But you have to do it for several sessions depending on the severity or need. thanks glenn! hmm, effective sya sa mga acne scars? Thanks, Glenn! hmm, so effective po sya sa mga acne scars mo?deep ba acne scars mo before? Acne scars na reddish. Deep acne scars can be cured with a different treatment ata. Best if you try to meet the derma. we have same experience. marami na rin akong nabiling gamot at napuntahang clinic. last na napuntahan ko obagi, okay naman un result kaso mahal talaga. matagal na akong naghahanap ng magaling na doktor with affordable service fee. sana ito na un, si dr. chua na. thank you so much sa blog post mo na 'to. thank you talaga!!! Anonymous - redness of scars got a huge improvement. as for the deep scars, other treatments are available. are you still going to him? Oh my gosh! Thank you for this post! Im looking for a good dermatologist cause the one i go to before was super pricey AND although a doctor saw me in the beginning, wala namang binigay na suggestion or diagnosis. Geeez! Like after nun puro beauticians n lng nila ung nakikita ko na puro facial lang at sila na ung nagsusuggest ng kung anong kelngn kong gawin. Kaya ngayon sana, i wanna make thngs right and just go to a good dermatologist para alaga tlga. I hope your doctor is really affordable. My problems not as problematic as yours but i wanted to really take care of my skin. So thank you so much! Really helps a lot!! hello po.. by appointment po ba consultation sa kanya.? or pe'de walk in? Hi, Arlyn! It's first come first served. No appointments allowed as far as I know. Walk in only. :) I suggest you go there upon opening, so you don't have to wait long. You're welcome. Hope it turns out good for you also. Pls do share my site to your family and friends. will definitely do! :) can i just ask also if you know if dr. mike chua accepts HMI / medical cards? Hi Juno! It's every month for the first 6 sessions and every other month or every other two months afterwards. Depends on the need and doctor's recommendation. If it's your first time, usually talagang consultation muna before treatment, so you have to pay for consultation fee + treatment. On your succeeding sessions, puwede derecho na treatment and ask stuff while you're being serviced. sorry i thought sa page 2 yung last post. OK after midterm punta ako diyan =D. 5k Budget ok na po ba yun? para isang puntahan nalang po. Pag commute po pla after mag MRT Ortigas/Shaw anong sasakyan? may mga public vehicle ba like Jeep or FX? or Taxi? or Puwedeng lakarin? nakita ko kasi sa google map sa likod siya ng SM Megamall. 5K is more than enough if facial and peel lang papagawa mo. If may others pa, baka kulangin, depende talaga. They accept credit card too if you have one. Never tried commuting going there because it's medyo looban. Kayang lakarin pero medyo malayo eh. So I suggest taxi. Sa may likod sya ng Megamall pero lampas pa sa may St. Francis Square, so medyo malayo. gosh! i have acne that wont go away even if my topical solutions na. ganun din ba sayo? and did he prescribe you oral meds? takot ako dun eh..
Hi Kai! Maybe it's not an acne anymore? Or maybe the topical solution you're putting isn't that good. Yup, he prescribed meds before during times I break out so much. But that was way before. Hi, nag-offer ba si Dr Mike ng botox treatment, RF, or any anti-aging treatment? thank you glenn I just hope this work talaga I availed the 6 months package. I have question during your IPL did you take acnetrex? Nope, I didn't take acnetrex because I don't have breakout during that time na. Acnetrex makes the skin dry and prevents pimples. It should be taken in moderation. It's effective. I've taken that way before pa.
Hi! It actually varies depending on what treatment I'm getting. Again, I always suggest for you to visit the derma to know your skin's condition and what treatment is best for you. But be ready to spend Php1,000 and above. Nice post! Thanks for sharing.. Though I have not been into a dermatologist. Great insight. I agree. Dr. Chua is a really good dermatologist. He knows what he's doing and very considerate to his patients in terms of fiancial constraints. Hindi sya mapilit na i-avail the tx unless you badly need it. Pang 2nd month na ng treatment ko with him and I'm very happy with results. I'm on IPL and acnetrex 6 month treatment. Very effective for my case of Severe cystic acne. Hello! I believe he only holds one clinic. If not, maybe at Metropolitan Hospital. Please call them to ask. As for the amount, perhaps the most basic would be Php5000 for cleaning, peel, IPL (if you need one), consultation/meds. But it's really best if you visit him to know what treatments your face needs. If you don't like what he suggests, it's okay not to have it done. glen last na bago na ko komunsulta ke doc,how much po ung ipl per session or there maybe any promos for that IPL, thx god bless you. Not sure how much na ang IPL ngayon. Mine was 15k for several sessions. where is it located? What time and date available? I will visit him. Hi! Details are at the bottom part of the post. Hi, Glenn. How much would it cost for just a consultation? Thank you! I think consultation is Php500. Though when you get treatments, it's usually waived. Thank you for that prompt response :) I just got some irritations after trying to scrub my face. Mild lang naman yung case ko, may ilan-ilang pimples and white heads na. Mga magkano budget for that? Do you have an idea? Around 1k-1500 for facial and peel. Saturdays are usually full of people. As it is first come first served basis, be prepared to wait. Yes, I definitely had :D Thank you for your blog. :D Ang sakit lang pala talaga, pinapakalma lang ako ni Doc. Haha. hi.. sa first visit ba may treatment na ba agad?? Sir nawala po ba ung malalim mong scars, o pinaless visible mo lng THX! Some nawala, yung mga malalalim may treatments kasi for those, pero I didn't avail. Again, best to go there for consultation. Different treatments cater to different situations. IPL, cleaning, peels, filler. Again it might not work for you. Please consult with him. Pearl Fraxel perhaps? Not sure. You should have asked doc about it. Again, iba iba tayo ng cases and corresponding treatments. ano po bang age ang pinakamagandang magpaDerma ??? Sino yung nag-attend sa'yo? si Dr. Chua tlga? hi glen, pwede ba after consultation k dr mike derecho na treatment that day? Hi Glenn! Thank you for sharing! Are you still visiting the same doctor? So far, effective pa din ba ang treatments? I am currently looking for a good derma for my acne problems. Thank you. Tumatanggap po ba sila ng health card sir glenn?